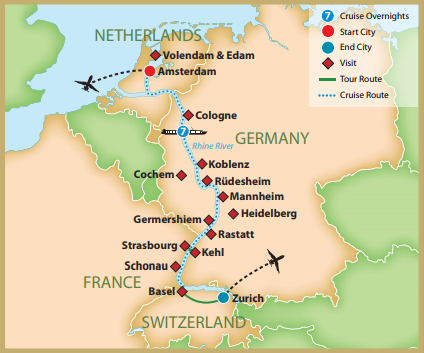 Enjoy a relaxing cruise on the Romantic Rhine, Europe's longest river. Travel on-board the deluxe MS Scenic Opal, exploring the wonderful Christmas Markets of Germany and France while absorbing the local, festive atmosphere at this magical time of year. DAY 1 – Depart the USA — Depart the USA on your overnight flight to Amsterdam, the Netherlands. DAY 2 – Amsterdam, the Netherlands — Upon arrival in Amsterdam, transfer to the ship for embarkation. The day is at leisure to begin exploring Amsterdam on your own. The ship remains in port overnight. Dinner. DAY 3 – Amsterdam — Begin the day with an iconic canal cruise and view the city from a different perspective as you pass historic buildings, lovely town-homes and churches at water level. Afterwards, explore on foot during a walking tour. OR, choose an excursion by coach to the charming villages of Volendam and Edam. Visit a cheese farm to learn how cheese is made and enjoy a sampling of the final product. Journey to Edam for an orientation tour and free time before arriving in Volendam, a traditional fishing village, full of authentic Dutch character, and colorful wooden houses surrounding the harbor. A brief orientation tour and free time to meander through the lanes will leave a lasting impression of this quaint village. Your river cruise begins with an early afternoon departure from Amsterdam and the remainder of the day spent relaxing on-board. Breakfast, Lunch, Dinner. DAY 4 – Cologne, Germany — Enjoy a leisurely morning cruising along the river before arriving in Cologne. This afternoon, a guided walking tour showcases the highlights of the city, including the magnificent cathedral which serves as the symbol of the city. You’ll have free time to visit the Christmas Market in the Domplatz, home to the largest Christmas tree in Rhineland. Breakfast, Lunch, Dinner. DAY 5 – Koblenz / Rüdesheim, Germany — As the ship docks in Koblenz, there is a choice of two activities. Explore Koblenz on a walking tour with a local guide and see this historic city which straddles two of Europe’s most beautiful rivers. In the old part of the city, the Christmas Market consists of glittering, festive, cottage-style stands and Lebkuchenherzen (traditional gingerbread hearts) to create a magical European Christmas experience. OR, travel by coach to Cochem and discover a true medieval gem resting on the banks of the Mosel River. Feel as if you’ve stepped straight into a fairytale as you have a guided tour through town that culminates with a visit to the iconic 19th century Reichsburg Castle. The ship departs Koblenz early afternoon for Rüdesheim and arrives this evening for an overnight in port. This afternoon, enjoy a landscape of castles and quaint towns as you cruise through the Rhine Gorge. Breakfast, Lunch, Dinner. DAY 6 – Rüdesheim, Germany — ‘All aboard’ as mini-trains meet near the ship and take you to Siegfried’s Musikkabinett Museum for a guided visit. Afterwards, enjoy free time in this quaint town to stroll through the picturesque lanes and along the famous Drosselgasse before re-boarding the trains for the return to the ship. During your free time, wander through the Christmas Market and search for the perfect gifts. Departing Rüdesheim mid-afternoon, enjoy the remainder of the day on-board and all the amenities of the Scenic Opal. Breakfast, Lunch, Dinner. DAY 7 – Mannheim / Rastatt, Germany — Awaken this morning in the town of Mannheim, departure point for the day’s activities. Your free choice activities include a visit to Heidelberg, with two options: visiting the castle and a walking tour, OR, a walking tour of the city with a tasting of local specialties such as their liqueur and the famous ‘student kiss’ chocolate. As your final port in Germany, don’t miss out on shopping for unique treasures at the Christmas Market in Heidelberg. During the excursion, the ship sails to Germershiem where you re-embark. This evening, arrive in Rastatt and enjoy a special treat as you attend a live concert in the baroque Rastatt Palace. Breakfast, Lunch, Dinner. DAY 8 – Strasbourg, France — With a morning arrival in Kehl, travel by coach across the river to Strasbourg, France, where a local guide leads you on an included walking tour through this picturesque town. Stroll through the charming Old Quarter, ‘La Petit France’, admire the half-timbered houses and marvel at the gothic cathedral in the city center. Enjoy free time to visit the stalls of Strasbourg’s Christkindelsmärik, one of the largest in Europe, before returning to the ship in Schonau. The final afternoon is spent cruising along the river to Basel, Switzerland. Breakfast, Lunch, Dinner. DAY 9 – Basel / Zurich / USA — It’s time to bid farewell to the Captain and crew and depart for the Zurich Airport as you say goodbye to Europe and return home with lifelong memories of your Christmas Markets cruise along the Rhine River. Breakfast. Itinerary and vessel are subject to change.